Is your preference not available? Call (0517) 234 234 for extra possibilities. Hotel Sneek Water sports and tourism have developed broadly in Sneek. This is due to the location of the city in a wetland area and the presence of an admirable historic center. Sneek several major events. The biggest and most famous is of course the Sneekweek, early August. Sneek Week is the largest sailing event in inland Europe. This takes place on the Sneekermeer and we also host two games of the SKS Skutsjesilen, namely from Terherne and at the end of the annual competition from Sneek. As part of the Frisian Eleven Cities, Sneek is the second city passed by the Elfstentocht. Of course, the 11 City Bike Tour also does the city. Anyone coming to Sneek should try a slice of the local specialty Drabbelkoek and a glass of beerenburg from Widow Joustra. In Sneek the people speak their own dialect: the Snekers. 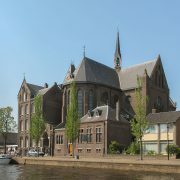 It is an advantageous way of staying overnight during your visit to Sneek. You sleep on a ship with an atmospheric salon as a central center. A comfortable and made-up bed awaits you in your cabin. 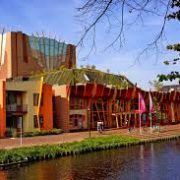 Sneek is known as a lively sports city, but the city's more! The city has many monuments and old town views. There are several museums and a cozy center with a variety of shops and is full of cafes, restaurants and terraces. In addition to the annually recurring events, 2018 has something very special, namely the festival. 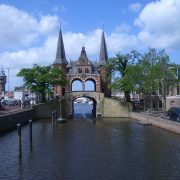 The 13e edition of the European Youth Music Festival (EYMF) takes place from 8 to 11 in various locations around the famous Waterpoort in Sneek and has therefore received the beautiful name 'At the Watergate'. As part of Leeuwarden-Fryslân 2018, this festival will promote regional culture and Frisian identity.